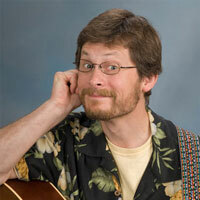 About The Artist: Eric Ode (pronounced Oh-dee) is a national award winning children’s singer/songwriter, an author and widely published poet, and a thoroughly engaging entertainer. His upbeat, high-participation programs are bubbling over with fun, interactive music and include stories, skits, poetry, props and puppets. A former elementary teacher of 12 years with a Masters Degree in Educational Technology, Eric has been invited to share his music and poetry programs with schools, community festivals, libraries, and churches all across the United States, in Japan and in Guam.